It has been a few months since volunteering on the June Laddership Circle and over a year now since my first encounter with ServiceSpace. Several things have unfolded but my intention remains the same. I’d like to share some stories and learnings over the past few months. In the Laddership Circles I mentioned wanting to become a full-time volunteer. I wanted to live within a gift ecology because this way of living felt more in alignment with how reality actually is. And the more in aligned with reality I felt, the greater the harmony I felt with everything. The more serendipity and magic seemed to flow through my life. With this fundamental mythology of separation, we feel nature out there is chaotic, dangerous, and uncertain. We therefore feel a need to conquer nature, to become the lords and masters of the universe to bring order into chaos - so that we may find the happiness we seek. But I don't want to conquer nature. I don’t want to become the lord and master of the universe. That feels to me like a path of self-destruction. Yet here I am. Deeply dependent on these systems for my very survival. I’m entangled and knotted in these systems of separation. How do I untangle? How do I discover the happiness I seek? How do I move towards a new story? One solution is to simplify my life. The rationale goes, the less I need (materially), the less I need to be involved in the current system. As my friend James likes to say, “starve the beast!” When I can say, yes I have enough, then my actions stem from a different mindset, one of abundance rather than scarcity, then new systemic alternatives can begin to emerge. This opens the door to multiple forms of capital. It also opens the door to spontaneous service. Through greater inner practice and realisation, Nipun’s quote that “service doesn't start when you have something to give; it blossoms naturally when you have nothing left to take” can be actualised. But what is enough for me? And how do I reach a space where I can feel like there is nothing left to take? To discover that space is the path of inner transformation - of circles, of noble friendships, of meditation, of small acts of kindness. I’ve never been to India, but I’ve been told that there are millions of sadhus across India that have devoted their lives entirely towards spirituality. They’ve renounced worldly affairs and gone ‘all in’ towards liberation. Often you see them dressed in just a loin cloth. They have no money, no home, and almost no possessions. Yet these people are venerated and supported by the general community. One vision that is arising comes from this question, what would it look like if there were millions of sadhus in Europe or America? People who felt like home was in the heart, where no matter their external circumstance they could continually bring forth compassion, love and joy? In conversations with Richard, a piano tuner from London who gave up living in his central London flat and started living outside instead, pieces are slowly coming together for an emergence of something, a new lifestyle, a new narrative. The summer just gone, I experimented with living outside in London for a few nights. Quotes from Satish Kumar about living under the “million star hotel” if he was not given a place to sleep, stories of Pancho being houseless, Guri and Nipun’s walking pilgrimage living on a dollar a day and Brother Zilong’s Journey to the East were all inspirations to continue following through with this. Funnily enough, as this conviction grew, that yes sleeping outside is a possibility - a way to live in London without falling prey to the rising price of rent - squeezing artists, poets, musicians and wannabe love warriors out of the city, gifts started flowing my way. People would offer me their homes for weeks, even months, to stay in. In India, the act of renouncing worldly pursuits is largely only a spiritual one. That same act however, done in Europe, could be seen as both a spiritual act and an act of activism - reflecting our growing culture of consumerism, decadence and YOLO-attitude. What would it take to bring a culture of sadhus into Europe? A movement of people who decide to renounce worldly pursuits to cultivate genuine happiness, to cultivate virtues of the heart and do small acts of kindness? Imagine in a city like London, where a group of women and men - say 1,000 of us, who have renounced worldly pursuits of wealth, fame, power and even sensual desires. Not because of religious dogma or blind faith, but because we’ve touched something much deeper and fulfilling than the temporary happiness we get from worldly pursuits. A thousand truth seekers, with a dedicated and committed practice of silence, who deliberately live an urban monk-ish life - intentionally homeless, a life of simplicity, dedicated to truth. Using the urban jungle as training grounds for service, compassion and living a life where “my life is my message”. I’ve heard we’re living in humanity’s most peaceful era. Yet how can we say we are living peacefully when we’ve wiped out half the number of wild animals on Earth in the past 40 years? When we lose 48 football fields worth of forest, every minute? When runaway climate change is potentially right around the corner? With our current trend, we’re not leaving behind a very peaceful world for our children to inherit. I came back recently from a 5-week teacher training retreat called Cultivating Emotional Balance and I want to gift the training to people. This weekend about 10 of us will come together for a silent weekend retreat on this theme. Seeds for spontaneous Awakin' circles are being planted too. In a circle back in 2015, the question, “what needs do you have?” came up and I asked for space - to organise more retreats, workshops and circles. Nipun talked about using the spaces already available - people’s homes. 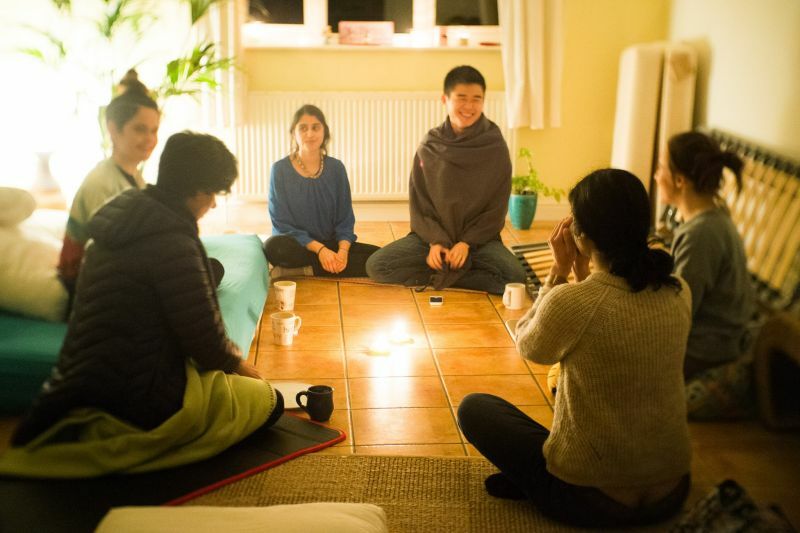 That seed is starting to germinate (with a mini circle at Divya's home in the photo below). There is also plenty of public urban space, whether it’s meditation meetups in train stations, street retreats or meditation flashmobs, I’m realising space is actually abundant :-). Life is mysterious, exciting and also sad at moments. Sometimes it’s all three at once. If you’ve read this far, haha, thank you! To know that there is a space of noble friends where I can express this journey is a beautiful gift to have received. I bow down to you all. Hi Liam it is so great to hear about your awakening, thanks for sharing and please keep doing so. I have recently taken the[View Link] intensive course, I believe you would enjoy (and be challenged) by the same, I think the next one is in January. If you ever get to Peru let me know, we hold space for everyone and would love to see you again. Thank you for thdse glimpses into your journey over recent months. So many rich insights and questions to hold.